In the age we live, it's imperative that we commit ourselves to make our building and grounds a safe place to worship and to serve. That's why we've started a new security team ministry and have outlined several necessary building upgrades building upgrades. To help us make these upgrades, we're calling the Maryland Heights Church family to partner with us in a special contribution set for Sunday, March 4. On that Sunday we ask every family to make a faithful financial commitment to enable us to complete these upgrades and make our church a safe place for members, children and guests. We're a church of 90 families and that means we need to average $240.00 per family in order to reach our goal. We know that several fixed-income families are unable to write a check of that size so that means families with means need to step up and make donations that double or triple that average. If you choose to make a one-time donation, you can note on your check that the gift is for our SAFE CHURCH CAMPAIGN and put it in the plate when we take up the Special Collection toward the start of our services on March 4. Families can increase their gift by spreading it out over ten months. By pledging an amount you'd like to give and fulfilling that pledge in ten monthly donations, everyone can contribute more than they thought possible toward this effort. You can review our pledge card HERE. Pick one up in the pew on March 4. Check or write in the TOTAL amount you'd like to pledge and let us know if you'd like to give by check or automatic withdrawal. 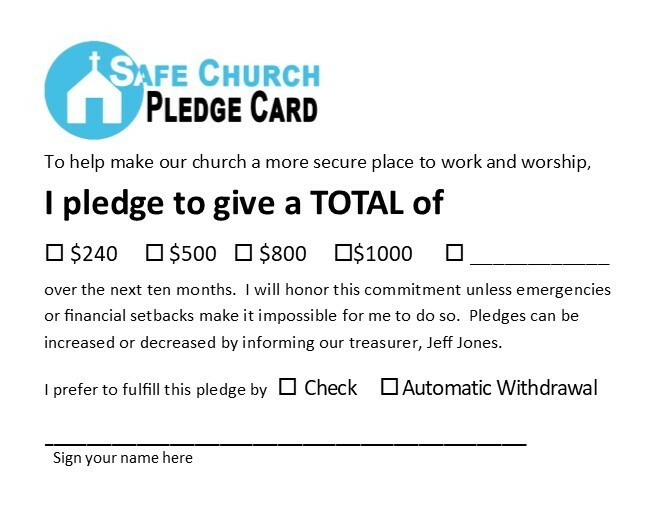 Drop the pledge card in the Special Collection plate and be a big contributor toward our SAFE CHURCH CAMPAIGN. It sounds like an ad for a slow cooker, but actually, it's our way of making it easy for you to fulfill your pledge. Just go to our secure donation portal and set up to have your donation automatically withdrawn from your account. It's an easy process that takes a couple of minutes, but once it's set up, you'll never have to worry about remembering to write out a check. The video below will guide you through the process. Click the GIVE NOW button to finalize your automatic withdrawal. There's an option to REGISTER near the top. It is not necessary to register but if you do set up a personal account you can view your giving and edit your automatic withdrawals on your own. You can set up your automatic withdrawal on your own below or we'll gladly help you. Just see one of our helpers in the rear of the auditorium on Sunday or click the "GET HELP" button below.